When I first started selling on Etsy, I quickly found the shop of My Bearded Pigeon, one of the top sellers. Her pillow covers were so beautifully photographed, it was easy to see why everyone wanted on them for their home. 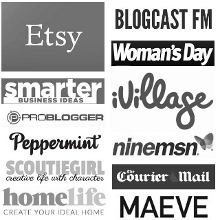 When Jess asked me to come up with a list of full-time makers to interview for Create & Thrive, I knew this Aussie seller HAD to be right near the top of my list. I’m so happy today to share the advice of Cath from My Bearded Pigeon. I have always liked making things, from a really young age I loved craft. It was always what I did but because I was never good at drawing in the sense of ‘draw this bowl of fruit so it looks exactly like the bowl of fruit’. I never saw myself as artistic. Looking back I would have loved to study fine arts after high school but due to my lack of drawing skills, I didn’t. Fast forward a hundred years and a move from the inner city of Sydney to a town of 2,000 people, and I find myself at home with a baby. I am a bit bored. I am completely in love with my baby and so happy but I feel so idle, and I keep looking at baby toys and clothes and thinking how all the stuff I can afford is so hideous and all the stuff I want is so expensive. So I start sewing simple clothes and toys for my baby and I discover crafty blogs and Etsy and chunky chooky is born…. as my baby became a toddler and then a little girl I realised I wanted to do something for grownups. Then one night I had the idea of putting maps onto cushions and My Bearded Pigeon was born. Having my cushion featured on the front cover of Real Living magazine. Featured seller on Etsy was also so exciting – although the timing was horrific I had the worst morning sickness/ tiredness and it was so busy – there was a lot of tears! But it was great!! Having 2 of my cushions in the Taubmans’ ad campaign which meant huge exposure with my cushions in the paint sample books in every Bunnings Australia wide. I want to be a whiz at Photoshop and Illustrator. I want to learn graphic design. I have an idea bursting in my head but it’s beyond Etsy really….. And I am still looking at HOW to do it in an eco way. Not really, I always have lots of ideas… It’s important to let you mind wander I think… I spend a lot when it’s just the baby and me in silence. No TV, no radio, etc. I think that helps new ideas float into your head. BALANCE is typing this one-handed on my iPad while I breastfeed the baby. Awake to baby gurgles, crawl from bed and start encouraging the 6 yo to get dressed, brush her teeth, etc. while shoving food and coffee into me and simultaneously reading the SMH online, breastfeeding, and getting ready to leave the house. Walk to school which involves a big hill. Then I collect stock from the studio (We built an amazing studio for me so the baby could have her own room. I don’t get to go down there much at the moment as it’s too far from the house to leave her in here asleep by herself so I go to and fro a lot and she sleeps with us but I am so glad it’s all finished!) to either cut fabric for sewing or pack orders. Then it’s just all that mum and baby stuff: feeding, playing, reading, singing, taking photos, having silly and inane texts with Neil that make me laugh, reading articles online so my brain doesn’t stop working, reading blogs… more baby stuff…..checking emails, maybe meet a friend for a coffee. If the baby has a sleep in the afternoon, not on top of me, then I will do some more MBP stuff as well as running around like a crazy person washing dishes, wrestling the washing piles, sweeping up the tumbleweed size dust balls. Neil gets home with our daughter at 3:30 and the whole homework, reading, feeding, bathing, etc. routine starts again. Once my daughter is home from school MBP is on hold until the next day. I am not a fan at all of Facebook. I don’t like some of the groups they allow and I hate the bullying that can go on so I am not great at maintaining my Facebook page and I am often confused about how it all works…. but from a marketing perspective, it is potentially amazing! However, I do like twitter. Yes, there is the same amount of bullying but you don’t see it in the same way. You only see the comments made by people you follow (except for re-tweets) but I just find it a lot less frustrating than FB and I have had some great exposure. I ending up talking to Shaynna Blaze one night on twitter and she used my cushions in a nation-wide Taubmans campaign. I have also had a few people with a lot of followers RT something I have said… this CAN lead to people looking at your profile and then hop skip jump to my Etsy shop, or they start following you and will work out what you do eventually….. so I would have to say Instagram as well has been great marketing. I put all new products on there and I get instant feedback and a lot of sales from the people I know via instgram, many of whom I met through blogging. I have heard twitter and instgram referred to as microblogging, I agree, I do like that about it but, you cant just tweet or IG your wares, its so boring when people do that! Did I answer the question? Yes: twitter and Instagram but see below! I can’t stop at one! Is there a market for what I am making? How many other people are making stuff like this? Have excellent branding, logos etc. if this means paying someone then do it. I met the graphic designer I still work with via etsy, she helped me with my chunkychooky logo, 5 years ago. I cannot stress to you enough how important I think this is. Have things professionally printed, business cards ( I use moo) which I put a hole in and also use as hangtags. I have sew on labels made too. Have everything consistent with the same name. So your twitter, FB, IG, blog etc all has the same name. The name must be catchy I think. Easy to spell and easy to remember… Think outside the box a little you are creative so be creative with the name! If I called my business Cath Young Homewares… its just not very interesting is it? When you come up with something Google the name to see if it is taken! This horrible word ‘networking’ I do not like this word. I heard someone describe it as you need to form relationships with people and be authentic. Be real. I totally agree. I get regular sales from people that I ‘know’ via social media, its really nice, I buy there stuff too. I think if you are going to be running a handmade business its great to shop handmade too and generally support handmade. I will still be learning and hopefully my business will still be growing. To be honest I don’t really know, but that’s exciting I think!